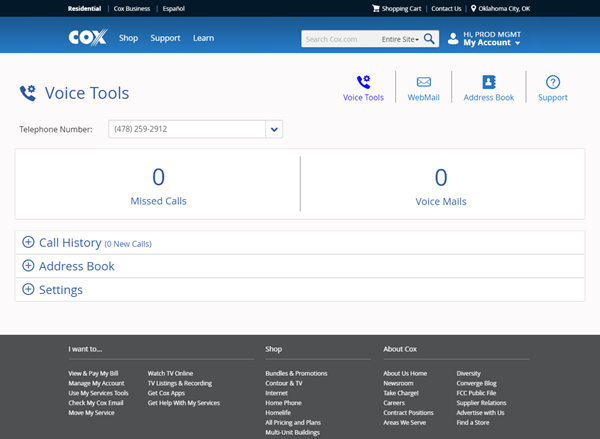 Voice Tools is a free service included with all Cox Voice packages to help you manage your home telephone experience online. With Voice Tools, you receive the following benefits. View more details related to Voice Tools Benefits and Features. Be a Cox Voice or Cox Digital Telephone subscriber. An internet-ready device with a web browser or the Cox Voice Everywhere app. The primary user ID and password that you created during your Cox.com account registration. See Cox.com Account Registration and Preferences for more information. Note: Secondary user IDs have limited access to Voice Tools features. Note: If you do not have login information, click No Account? Register Now! and enter your account number or address and SSN Last 4 Digits or Cox PIN found on your bill. Select the Voice Tools feature below to learn more about the feature.